Third Person Press: Read All About Us! 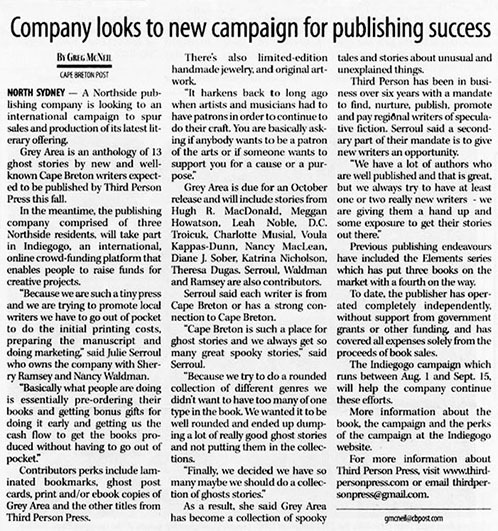 Over the weekend, Third Person Press and our Indiegogo Funding Campaign were featured in an article by Greg McNeil in the Cape Breton Post. Thanks Greg for a comprehensive article that explains why we are asking for broad community help in funding Grey Area: 13 Ghost Stories. Hugh R. MacDonald on "Stillborn"
Voula Kappas-Dunn & "Teetering on the Edge"
Diane J. Sober discusses "This is My Land"
D.C. Troicuk talks about "Out of the Deep"
Meggan Howatson: one of our NEW writers! The Crowd-funding Campaign is Underway!